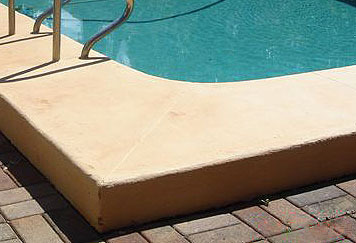 Some concrete pools show red – brown stains on the surface. These maybe due to leaves, bottle tops etc or rusting reinforcing steel. To determine which you have rub the area with some sand paper. If the stain starts to disappear then it’s a surface stain and of little interest. However if the stain continues to develop and grow more as you rub into the surface, then it’s most likely coming up from below. This indicates the reinforcing steel in the concrete is corroding. 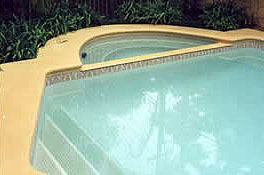 (See the pictures below) Cracks can let pool water into the concrete and create problems. Water (ground) can also be coming from below though porous concrete. Ideally all concrete pools will have at least 50 mm of concrete cover over steel reinforcement bars to prevent corrosion from occurring, however this is not always achieved at the time of installation. Also some areas of concrete may not be compacted enough allowing water to pass slowly through the concrete, causing corrosion of the steel. Such surface signs indicate that work is needed to treat this as left unattended it will result in further and more costly damage. Simply painting over it will not stop the corrosion developing further and it will break through the new paint. The rust needs to be completely removed from the steel before the concrete cover is re-established. Where this rust has reappeared could indicate it was not completely removed previously or that moisture is still penetrating the protective coating. What you may see once you start digging into the rust spot. On closer inspection it can be seen that the rust is all around the steel and the concrete needs to be dug out completely and rusty steel exposed on ALL sides. It’s vital to dig all concrete away from rusted steel and expose it. Then wire brush all loose rust off. Once back to sound steel, apply an oil based anti corrosive primer or a kelate (rust converter). These are available from all good paint shops. ( or a propriety mix) and cure correctly by keeping moist for several days in hot weather. You can smooth off the final surface to match adjoining areas. The finished surface which now blends in with nearby areas, is ready for coating with Epotec. Done well and with all the rusted reinforcing steel exposed, treated and recovered there should be no more corrosion from this area. It does not mean that corrosion is stopped anywhere else. This maybe happening , but has not yet broken through. 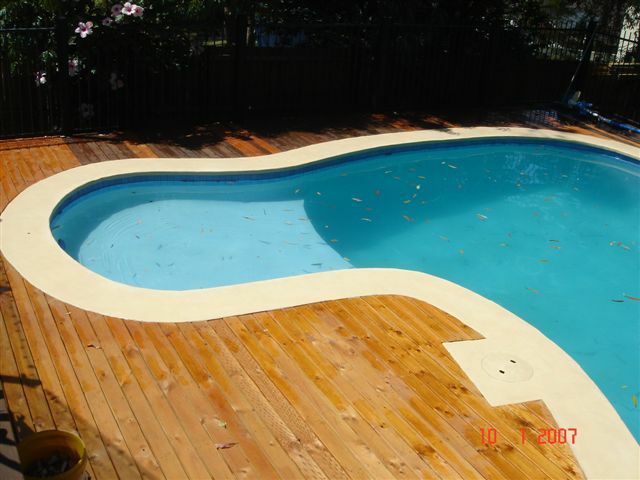 By coating the pool with Epotec any such corrosion maybe reduced in its rate of activity. Note that ground water may also cause corrosion from the other side. If you have a salt water pool, it’s important that this salty pool water is kept separate from the steel and using an impervious long lasting coating like Epotec will greatly assist in this matter. For more details please see the Preparation and Application Notes for Epotec and if in doubt contact us for further assistance.